Tonight for the Missouri Democratic Party there were ward and county mass meetings to select delegates to congressional district meetings at the end of this month and the state Democratic Party convention in June. The delegates elected across the state tonight will eventually vote for delegates to the national convention. The allocations for Hillary Clinton and Bernie Sanders delegates to the national convention have been made based on the vote in the primary. That distribution will not change over the length of the process. At the congressional district and state party convention levels Hillary and Bernie county level delegates will only vote for those individuals running for national delegates for their respective candidates. However, all state convention delegates will vote for Missouri’s members of the Democratic National Committee. Hold that thought. Signing in at the county mass meeting – the first step in the Missouri Democratic Party national convention delegate selection process. In Johnson County registered voters who voted in the primary started showing up at the mass meeting site at around 6:30 p.m. If an individual wanted to participate in the process they needed to be in the door by 7:30 p.m. By that deadline twenty-two individuals eligible to participate showed up and signed in. Twenty-two. Hold that thought. The allocation of the total number of county level delegates is based on previous general election results in voting for the Democratic Party candidates for president and governor. Johnson County was allocated ten delegates and ten alternates to the congressional district meeting and the state party convention. Do the math. Twenty-two people, and a total of twenty delegate/alternate slots. Further, the allocation of Hillary and Bernie local delegates from that number is based on the congressional district vote in the primary, with a 15% minimum threshold. For Johnson County that meant six delegates/six alternates for Bernie Sanders and four delegates/four alternates for Hillary Clinton. Democratic Party rules call for a strict distribution of 50% female/50% male delegates at all levels. 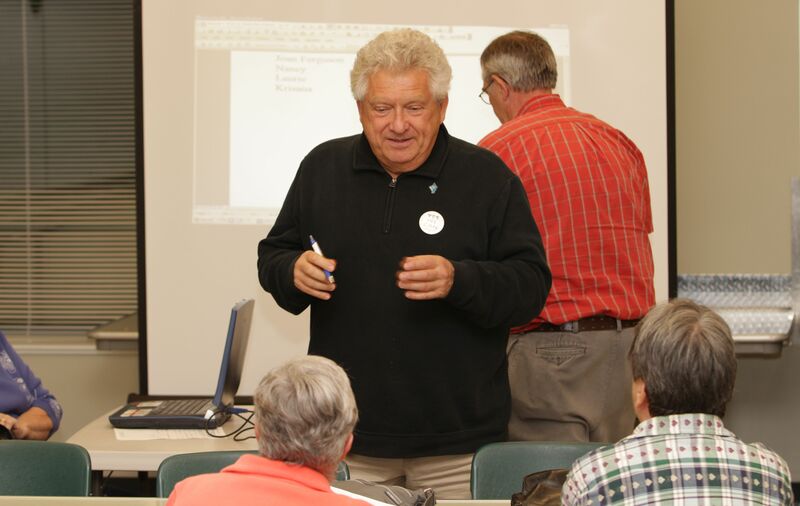 In practice, the odds are fairly good that a county alternate will end up being seated as a voting delegate at the congressional district meeting and the state convention. There is always attrition of delegates because of health, travel issues, etc. It’s important that those alternate slots are filled and that the alternates show up at the subsequent congressional district meeting and the state convention. The Hillary Clinton caucus at the Johnson County Democratic Party mass meeting. If your revolution is intent on taking over the party you’re going to have to understand the rules in place at the time of your attempted takeover. Also, it helps to show up. One of those in attendance at the Johnson County mass meeting reported to us that another of their local friends, a supporter of Bernie Sanders, put out a call via social media for Bernie supporters to show up at the Johnson County mass meeting – informing them that if Hillary supporters didn’t show up they could take over those delegate and alternate slots allocated to Hillary. It doesn’t quite work that way. When you show up to the mass meeting you fill out and sign a Form B, pledging your support to one candidate or the other. It may be possible to flip delegate allocations in other states – that’s not exactly the case in Missouri. Oh, and if you’re going to throw a revolution you need to show up. Of the twenty-two people eligible to participate in the process in Johnson County this evening fourteen caucused for Hillary Clinton and eight caucused for Bernie Sanders. The Hillary Clinton caucus filled all of its delegate and alternate slots (eight). It was impossible for the Bernie Sanders caucus to fill all of its delegate and alternate slots (twelve). If this is the state of the Bernie Sanders revolution across the state what do you think the chances are of a takeover of the state party or of flipping Missouri’s representatives on the Democratic National Committee? In Macon County, we had 24 show up. 14 for Hillary and 10 for Bernie. We were able to fill our slots. Don’t be discouraged! I am in a rural county and we had 8 people show up. 6 of them because I had a local Bernie page that they followed. The other 2 were gentlemen in their late 70’s and early 80’s! They were willing to be alternates but not delegates. I talked the 80 yr old into being a delegate! and his friend into backing him as an alternate. We needed 1 woman and 1 man. I was the only one that came to be a delegate…but we got it done. This campaign is about networking and committing because WE need change. I’m definitely not discouraged. I’ve witnessed this every election cycle for decades. I’ll be impressed with the Bernie Sanders revolution when all of those activists and voters show up for the 2018 election cycle. They won’t. I can do the math. I remain unimpressed. Johnson county did fill all of it’s delegates, but not alternates. So the delegates just need to show up at the State Convention. St. Charles filled it for Bernie with alternates. 2nd congressional in St. Charles for Hillary failed viability and lost 14 delegates. That’s delegates, not alternates. If it’s a county level mass meeting alternates from another county in the congressional district meeting can fill a delegate slot. This can also happen in the same situation at the state convention. In the past at the state convention alternates from one congressional district have filled state delegate slots in other congressional districts. There is no change to the distribution of delegates to the national convention. That allocation was determined by the primary vote in the congressional districts and statewide. The Bernie participants at the congressional district meetings will only vote on the individuals to fill the already allocated congressional district level national convention delegates allocated to Bernie. The Hillary participants at the congressional district meetings will only vote on the individuals to fill the already allocated congressional district level national convention delegates allocated to Hillary. That’s why you sign a Form B supporting a specific candidate. If fewer people show up to the congressional district meeting than delegate slots (highly unlikely, very highly unlikely, approaching a probability of zero) those unfilled congressional district national delegate slots revert to the state convention where they will be filled by someone who signed a Form B supporting that candidate and elected by like individuals who also signed Form B supporting the same candidate. The Democratic Party national delegate distribution in Missouri for the candidates will not change. However, all delegates at the state convention vote to elect Missouri’s members of the Democratic National Committee (slates and individuals run) and Missouri’s Electors (uh, that to the Electoral College, the only individuals who actually do get to vote for president, if, and only if, the party’s candidate takes the popular vote in the state). At the meeting I attended we had 10 people show up. Bernie was to get five delegates and Hillary 4. But only one of us supported Hillary. The revolution was stronger here in Ellisville, MO than the establishment. Again, if this is the case across the state it does not change the allocation of delegates to the national convention. It just makes it easier for someone who wants to be elected a Hillary Clinton delegate to the national convention – there are fewer potential candidates for those limited slots (Form F!) and the fewer state delegates attending on behalf of Hillary the greater the weight a vote of those who do show up for Hillary. It’s basic math. I would also add that nine people showing up to potentially fill five delegate and five alternate slots for Bernie ain’t exactly an impressive revolution. Good luck taking over those Democratic National Committee seats..
How was this meeting on the 7th publicized? I’m a resident of Johnson County and a Democrat and didn’t know a thing about this meeting. Your blog entry was brought to my attention by a friend who read it this morning. 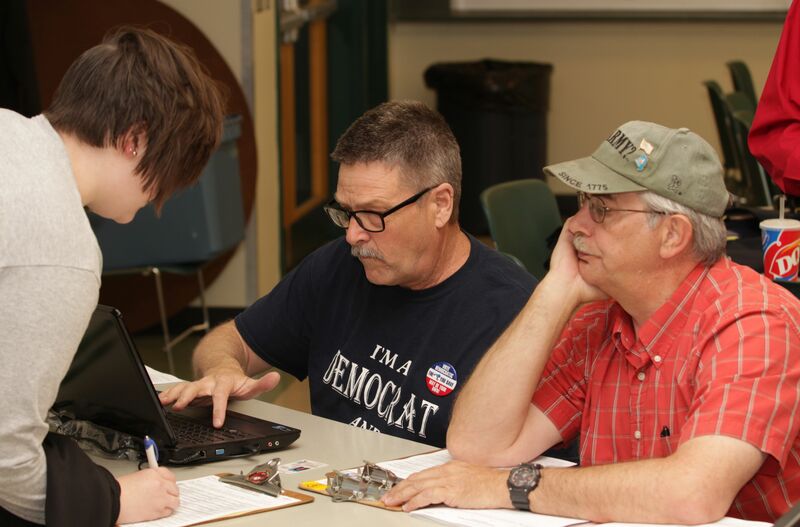 The county Democratic Party Committees are required to run ads within a specific time frame and with a specific frequency in the local paper by the state party. If I recall correctly that requirement is in the state party delegate selection plan. The Missouri Democratic Party delegate selection plan has been easily accessible online for a really, really long time. The dates for the delegate selection process have been set for a really long time. It’s easily accessible online. Campaigns and party clubs and committees have used social media to also augment that information. I know the Johnson County Democratic social media page did so several times- over a lengthy period of time. The Johnson County Democratic Committee and the Johnson County Democratic Club hold monthly meetings in Warrensburg. For at least a decade those meetings are held every third Thursday of the month at the same time and the same location in Warrensburg.These are also advertised by various means. For a period of at least six month the primary date, mass meeting dates, and state convention date and delegate selection processes have been significant agenda and discussion items at those meetings. While we don’t register to vote by party in Missouri – all it takes to be a Democrat is to say that you’re a Democrat – it’s up to individuals to get involved. If you don’t self identify to the county Democratic Committee and/or local Democratic club just calling yourself a Democrat is not sufficient to let them know you exist. If you don’t make an effort to read the local paper, read or watch the local news (this is not my strongest point – they cover American Idol or The Voice more than they cover the delegate selection process mass meeting dates), participate in the party in a fashion that is more than just being voter, or seek out the local party social media presence (they are there) you can only blame yourself for missing the meeting. We had more than 200 Bernie supporters show up for the Boone County mass meeting and 50 people run for our 21 delegate and 21 alternate slots. We were there until midnight counting votes. We had that many because we have a strong group that widely used social media to get the word out. People don’t read print newspapers anymore and unless you already knew that voting in the primary was only the first step you would have no idea that you need to go online to find delegate selection information. Many Bernie supporters are first time participants or self identified independents who wouldn’t necessarily know the ins and outs of party process. Boone county shows that with informed leadership the enthusiasm can be harnessed to make change. Bernie 2016! That’s great! Awesome! I’ll be really impressed if those 200 Bernie supporters show up for the 2018 election process as volunteers and voters. It still doesn’t change the distribution of allocated delegates o the Democratic National Convention. The proportions of pledged congressional district national delegates, pledged at large statewide national delegates and pledged Party Leader Elected Official national delegates won’t change. That was set by the primary results. Oh, and by the way, the Missouri representatives to the national convention standing committees are also elected proportionally to the primary vote. So, there you go. Self identified independents? Well, maybe they won’t show up in 2018. You think they showed up in 2010 and 2014? Just asking.